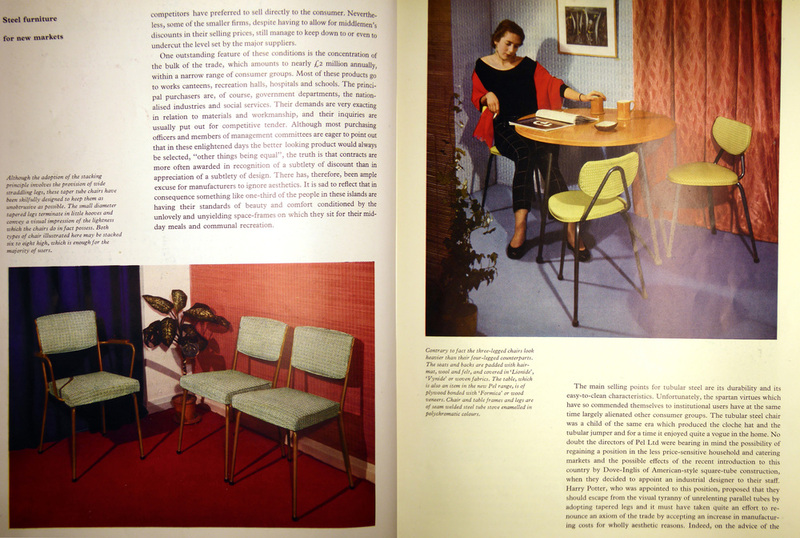 A selection of articles in Design magazine in the 1950s written by Bruce Archer. The articles are represented by images of the opening double pages, taken from bound volumes in the RCA Library. We hope to make the full articles available at a later stage. These pages from Design are reproduced with the permission of University of Brighton Design Archives. The Design Council began as the Council of Industrial Design in 1944 and had a key role in the Britain Can Make It exhibition at the V&A in 1946. It changed its name to the Design Council in 1972. The Council's magazine Design was published from 1949 to 1999. Before he worked at the RCA, Archer was a frequent author of articles for Design, during the editorship of Michael Farr who took over from the founding editor Alec Davis in 1952. Key ideas emerge that later inform his work at the RCA. 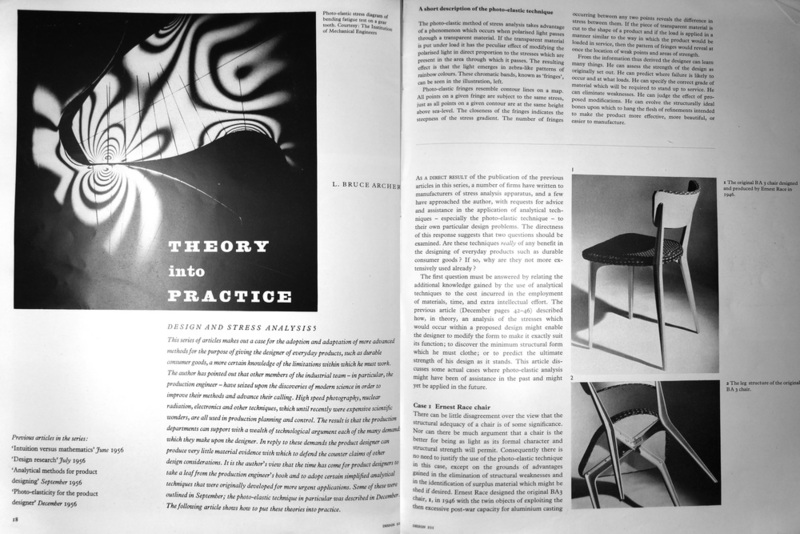 His first article (Archer 1954) argues the importance of both creative invention and profound technical knowledge in an industrial designer, a theme reprised a year later (Archer 1955). 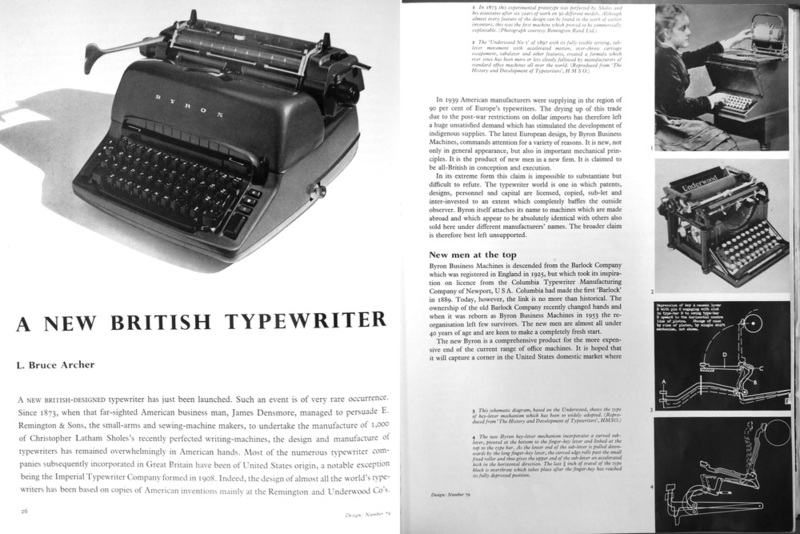 He then contributed a design analysis of a new typewriter (Archer 1955), highlighting poor British industrial innovation compared with competitors, a topic often revisited. 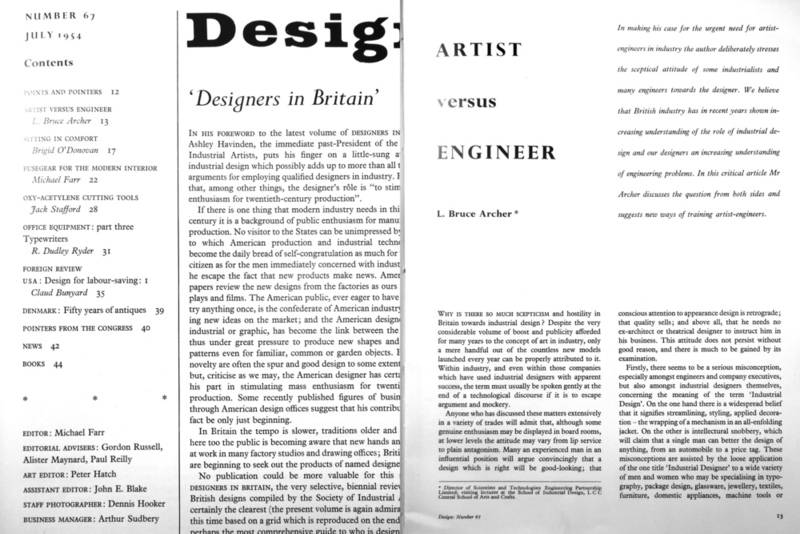 Four articles from 1956 (Archer 1956) begin a series again arguing against purely technical engineers working by rule of thumb: the industrial designer needs to be informed by both art and science. In the second article of the series, Archer complains about the low proportion of 'trained men engaged in scientific and technological work' compared to other nations (Archer 1956:32). Design Research is envisaged as including the calculation of the bounding space of optimal solutions - later a key part of Archer's thesis. Archer notes how 'amateurism in management plays a very big part' in Britain's industrial failure (p.33). He is increasingly sanguine about science: 'Herein lies the brightest hope for progress in design research and for the recovery of the art of designing from its present intimidated state' (p.35). 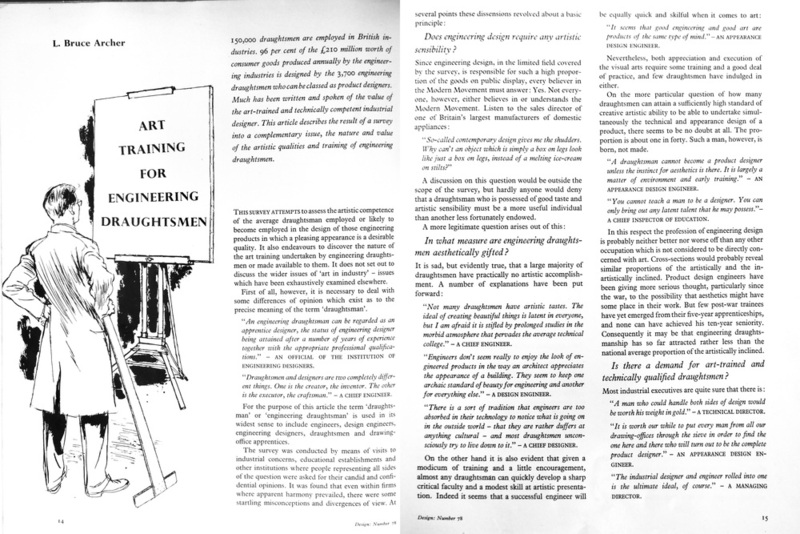 The final series article (Archer and Zaczek 1956) calls again for more rigour in designing - from whatever discipline. Archer's next article (1957) again calls for more science in design, but still does not necessarily require a science of design. 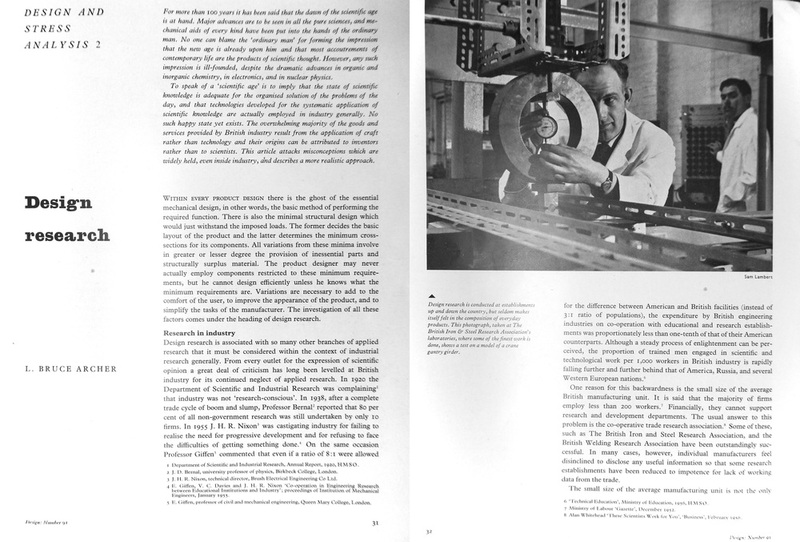 A series of articles with J. Beresford-Evans (later a visiting lecturer under Misha Black and a key styling designer with him of diesel locomotives for British Rail (Jackson 2013: 63)) show Beresford-Evans focusing on the aesthetic aspects while Archer subjects cooking pans (Beresford-Evans and Archer 1957), hand axes (Archer and Beresford-Evans 1957), and a free-standing fire (Beresford-Evans and Archer 1957) to a series of tests. Archer continued writing design analysis articles into the next decade. The 1957 articles emphasise the need to combine subjective and objective evaluation. There is a focus on qualities that matter to people, 'almost atavistic' and 'endowed with life' in the case of the domestic hearth (p.53). In 'Honest Styling' (1957) Archer makes the telling remark that the manufacturer has considered 'not merely a machine, but a man/machine/work system'. Every article, however much it might seem to focus on a single process or artefact, included wider observations on the nature of design, on industry and society. Archer thought these articles were a reason why Misha Black invited him to work at the RCA in 1961. Archer was a vital contributor to the work of the Design Council, as a member of Council for ten years and of many of its committees. In 1975, Archer offered a 'Proposal to set up machinery to aid the product development side of national economic recovery'. The proposed Design Development Board anticipates the much later UK Technology Strategy Board, though with more emphasis on design. In this letter, Archer asks Sir Paul Reilly, Director of the Design Council, to have a word with the Prime Minister (Harold Wilson) or Tony Benn ( Secretary of State for Industry) about his proposal for a Design Development Board. The letter and accompanying 2-page proposal are in the Design Council Archive at University of Brighton. Reproduced here with permission. L. Bruce Archer. Design 75, March 1955. Gumboots in the Drawing Office. 35-38. L. Bruce Archer. Design 78, June 1955. Art Training for Engineering Draughtsmen. 14-18. L. Bruce Archer. Design 79, July 1955. A New British Typewriter. 26-29. L. Bruce Archer. Design 85, January 1956. Steel furniture for new markets. 35-38. L. Bruce Archer. Design 90, June 1956. 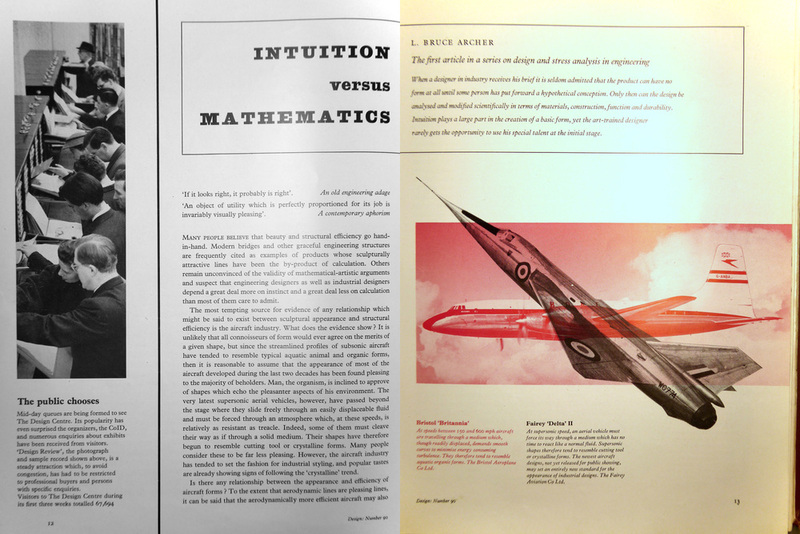 Intuition versus mathematics. 12-19. L. Bruce Archer. Design 91, July 1956. Design research [Design and Stress Analysis 2]. 31-35. L. Bruce Archer. Design 93, October 1956. Analytical methods for product designing [Design and Stress Analysis 3]. 29-33. L. Bruce Archer and Bohdan J. Zaczek. Design 96, December 1956. Photo-elasticity for the product designer [Design and Stress Analysis 4]. 42-46. L. Bruce Archer. Design 101, May 1957. Theory into practice. 18-23. J. Beresford-Evans and L. Bruce Archer. Design 102, June 1957. Design analysis 3 - stainless steel cooking pans. 26-30. L. Bruce Archer and J. Beresford-Evans. Design 104, August 1957. Design analysis 4 - general purpose axe. 20-25. J. Beresford-Evans and L. Bruce Archer. Design 106, October 1957. Design analysis 3 – free-standing fire. 52-56. L. Bruce Archer. Design 107, November 1957. 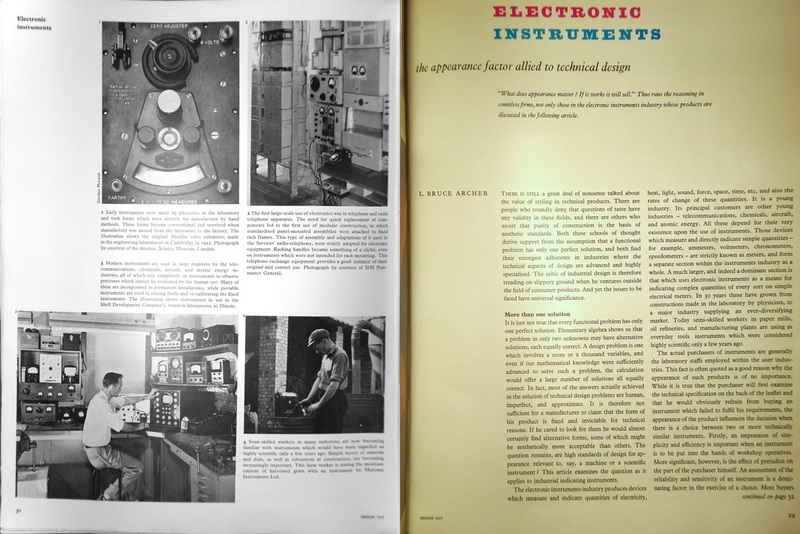 Electronic Instruments. 29-33. L. Bruce Archer. Design 108, December 1957. Honest Styling. 36-39. Jackson, Tanya. (2013) British Rail: The Nation’s Railway. The History Press.